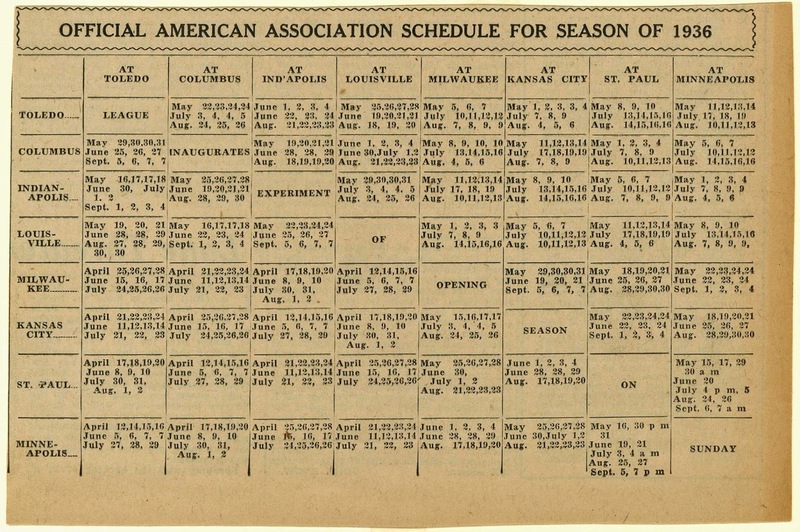 This league schedule table was published in the Sporting News in early 1936. 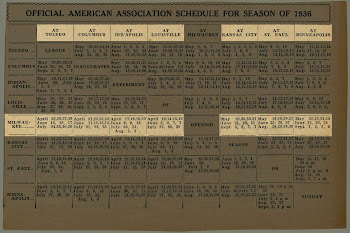 It shows all the matchups for the Association. 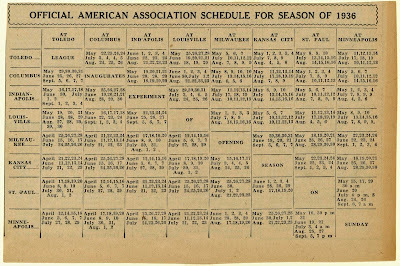 As the notation indicates, the Association was experimenting that year with holding their Season Opener on a Sunday. This is what fans in '36 had to look forward to, eighty years ago. This dapper fellow is Chauncey Yockey. A lawyer by trade, he came to Milwaukee after graduating from law school at Notre Dame. Yockey threw himself into the civic life of his adopted hometown, serving terms on the Milwaukee Common Council and Wisconsin State Assembly. He became known as one of the city's great boosters, being appointed the "official greeter" of Wisconsin by Governor Philip La Follette and of Milwaukee by Mayor Daniel Hoan. 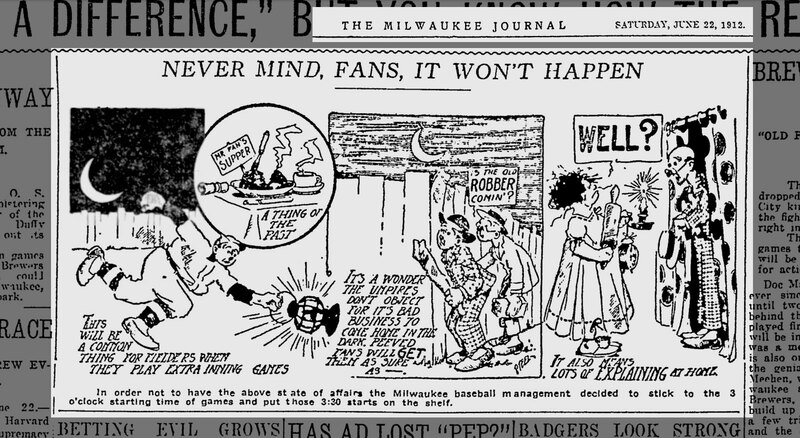 And in 1933, he led a group of investors to buy the Milwaukee Brewers. A group of base-ball backers in Milwaukee, Wis. to-day took over the control of the Milwaukee Brewers (American Association) with Chauncey Yockey (above) named as president of the club. 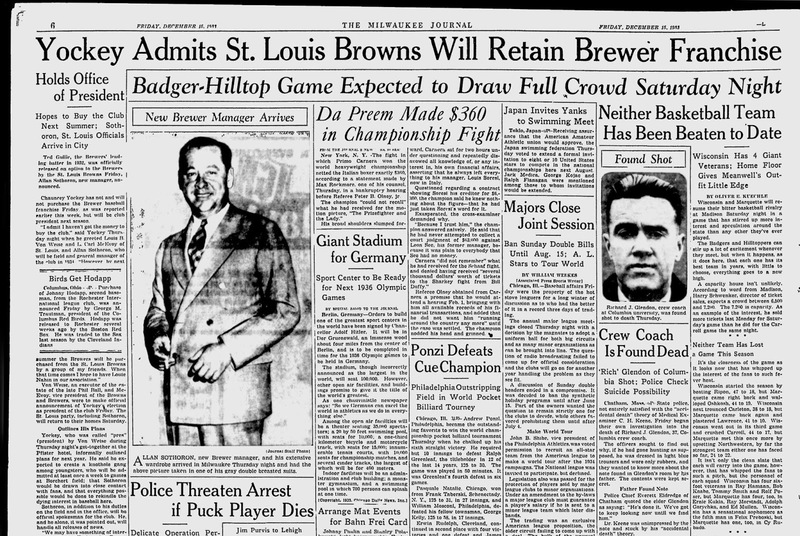 Although the control of the team will be in Milwaukee, St. Louis Browns will keep a small share of stock and have exchange privilages (sic) as in the past. Al Sothoron, present coach of the St. Louis Browns will be the manager of the newly organized team, and a general shake-up of the old Brewers is planned. Yockey was perhaps most notable for his work with the Benevolent and Protective Order of Elks, where he had been serving as the Exalted Ruler of the Elks Lodge #46 in Milwaukee since 1917. It was at the Lodge where Yockey met fellow Elk and Brewers owner Otto Borchert, who was to become one of his closest friends. Yockey's civic boosterism went hand-in-hand with its sporting life, and beginning in 1926 his Lodge hosted an annual banquet honoring the Brews on the night before the home opener. This tradition would continue until the end of the Milwaukee Braves era. 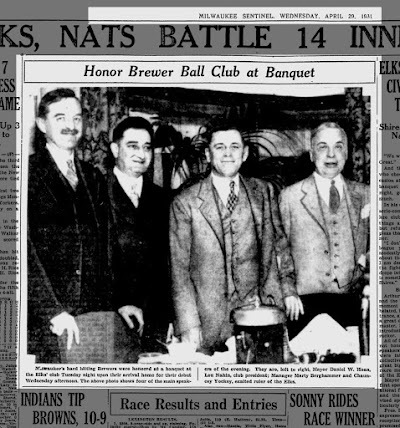 Milwaukee's hard-hitting Brewers (of 1931) were honored at a banquet at the Elks' club Tuesday night upon their arrival home for their debut Wednesday afternoon. The above photo shows four of the main speakers of the evening. They are, left to right, Mayor Daniel W. Hoan, Lou Nahin, club president; Manager Marty Berghammer and Chauncey Yockey, exalted ruler of the Elks. The tradition barely had a chance to begin before being struck by tragedy. Otto Borchert collapsed and died just before completing a ten-minute speech at the second annual banquet. Yockey and his Elks took charge of the funeral arrangements, hosting his services at their clubhouse. 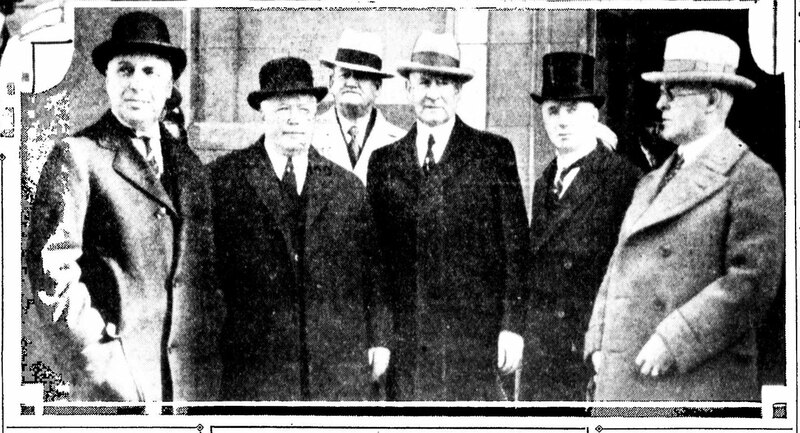 Some of (Otto Borchert's "staunchest friends" outside his funeral at the Elks' clubhouse: from left to right: Chauncey Yockey, exalted ruler of the Elks; Oscar Greenwald, R. J. Conway of the Minneapolis club; President Tom Hickey of the American association; E. J. Archambault and President Joe Carr of Columbus. 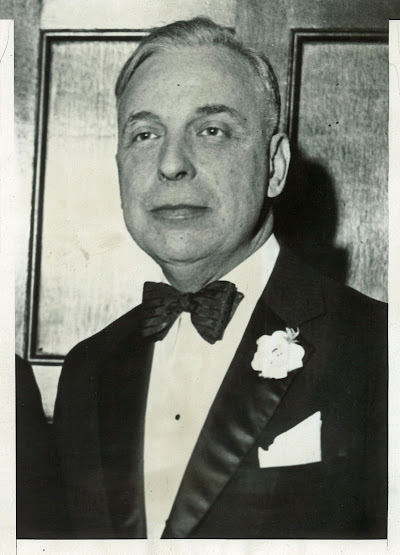 So Yockey's local connections were well-established when it was announced on December 12, 1933 that his group had a deal to purchase the Brews from the estate of Phil Ball of St. Louis. 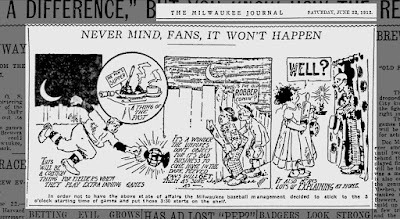 The Brews had been in a bit of a funk in recent seasons (including a seventh-place 67-87 finish in 1933), which the fans laid squarely at the feet of their distant owner. 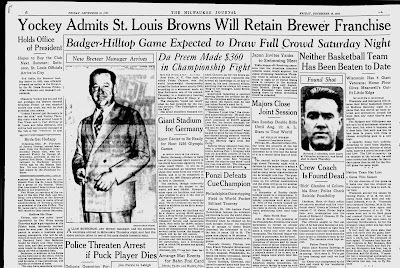 Ball also owned the St. Louis Browns, making the Brews their farm club. Fans of the previously-independent club chafed under four years of what was called "chain baseball." They wanted local owners, members of the community who would put the Brewers' fortunes first and not use them as a feeder for a major league roster. Yockey seemed poised to deliver. In retrospect, it's a bit disingenuous for the ACME wire service to have described Yockey's group as "Milwaukee sportsmen". In truth, almost all of the money was coming from Chicago-based interests. Chief among these was William J. Sinek, vice president of the Chicago City Ice & Fuel Company and, like Yockey, exalted ruler of his local Elks lodge. Yockey's group came in swinging, firing long time president Louis Nahin, who had been with the club in various capacities for twenty-three years. Yockey also axed third-year manager Frank O'Rourke, installing himself as the prexy and Browns coach Allan Sothoron as the new skipper. Those were intended to be the first of many changes for the Brewers' new owners, but the group immediately began to unravel. 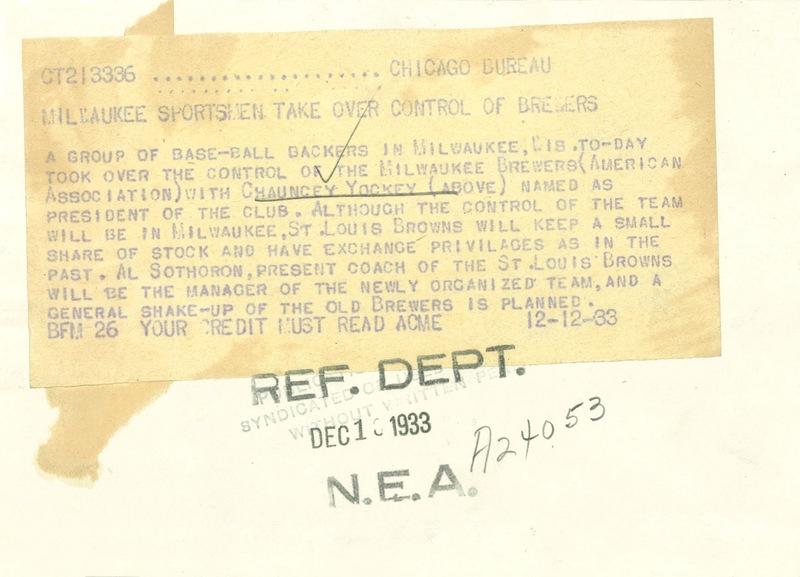 Just days after issuing his triumphant press release, Yockey admitted that his group didn't actually have the money to purchase the Brewers, that he had been placed in his position as president by the Ball estate, and that he hoped to have sufficient funds to complete the sale "by the summer". Brewer fans braced for yet another year of "chain baseball." Meanwhile, Nahin quietly continued to run the Brewers even without a conract. 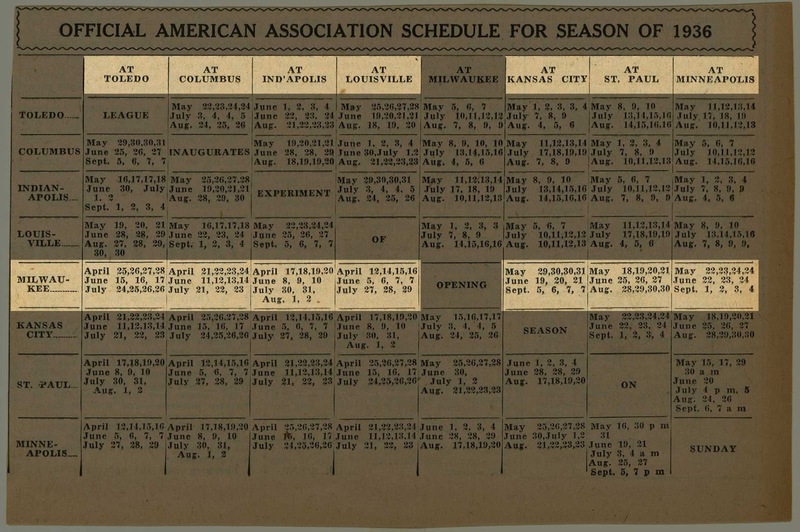 Yockey did have some good ideas for reviving the struggling club, including the creation of "a knothole gang among youngsters, who (would) be admitted at least once a week to games at Borchert field". He was never given an opportunity to put them into practice; on January 4th, 1934 it was reported that Yockey was let go from his position, and Louis Nahin was officially hired back as the club's business manager. When Milwaukee lawyer Henry Bendiger finally purchased the team in April, Nahin's position was once again made permanent. Yockey had around twenty-two days "in control" of the Brewers before his bid fell apart, closing a brief but strange chapter in the ownership story of our Brewers. I wonder what "the official greeter of Milwaukee" could have made of it had he partnered with Bendiger or another local investor. 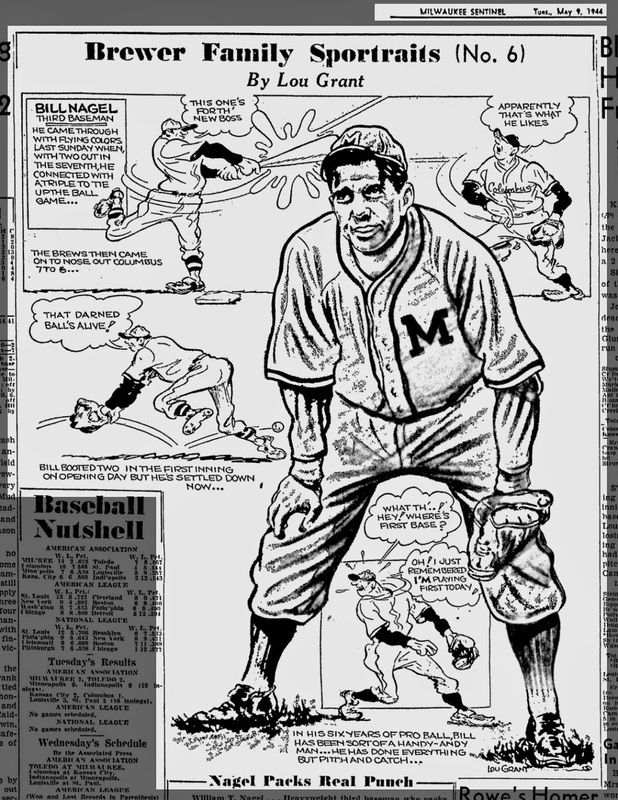 Today we feature another in the line of "Brewer Sportraits" cartoons from Milwaukee Sentinel artist Lou Grant. 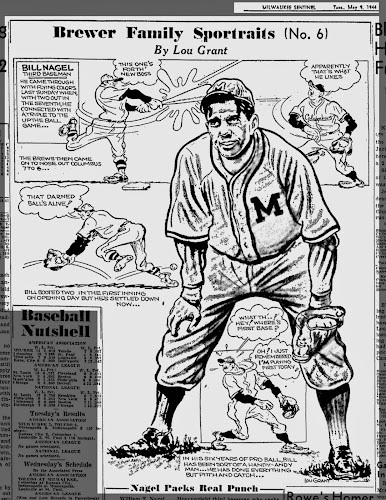 Today, the subject is Brewer third baseman Bill Nagel. We've previously looked at Nagel's career in Milwaukee. He was brought to the Cream City after the 1943 season by president Bill Veeck, one of Sport Shirt Bill's last deals before enlisting in the Marine Corps. The slugging third-sacker was valuable enough to attract major-league attention before he even spent a single season at the Orchard; he was sold to the Chicago White Sox in August of 1944, but remained in a Brewer uniform long enough to help the club win its second consecutive pennant. A 3:30 start? "Never Mind Fans, It Won't Happen"